On the 15th of November, 2011, musician, composer and keyboard player Mark "Moogy" Klingman lost his battle with cancer. As sad and tragic a passing as it was (as are all who succumb to that dreadful disease), it is just as sad – from a musical point of view – that his passing is not mourned or recognised at a much larger level. New Yorker Moogy Klingman joined Jimmy James and the Blue Flames (featuring Jimi Hendrix and Randy California) when he was sixteen and would go on to perform with his own bands Glitterhouse and Moogy & the Rhythm Kings. Klingman's best known musical association is with Todd Rundgren, their relationship going back to 1969. He and Rundgren built the Secret Sound studio in his Manhattan loft where Rundgren recorded and produced both his own material (including the critically acclaimed album A Wizard A True Star) and other artists work. Klingman was an important player in Rundgren’s earliest musical adventures and was an integral member of Todd Rundgren’s Utopia from the early to mid-70’s. He co-wrote 'Freak Parade' and the progressive art-rock epic 'The Ikon,' both of which feature on the band's debut album. Klingman was also associated with Bette Midler. He and Buzzy Linhart wrote what became one of her signature tunes ‘(You Got to Have) Friends,’ which appeared on her 1972 album The Divine Miss M.
He also played keyboards on and co-produced Bette Midler's 1976 album, Songs for the New Depression. Other noted musical collaborations amongst what became a who’s who of name checks included co-founding The Peaceniks with Barry Gruber and playing in the Moogy/Woody Band, alongside noted Allman Brothers musicians Allan Woody and Warren Haynes. Klingman also released a couple of solo albums, which included songs that would later be covered or recorded by a number of well-known artists such as Johnny Winter, Eric Clapton and Barry Manilow, to name but three. His ballad ‘Dust in the Wind’ was recorded by Rundgren and performed live on occasion by Guns ‘N' Roses. Later musical projects included Moogy & the MoJo's and Klingman continued to perform around the Manhattan area with his band Freak Parade. Other bands that included some of his fellow ex-Utopians were put together, performing live until illness restricted his playing and appearances. 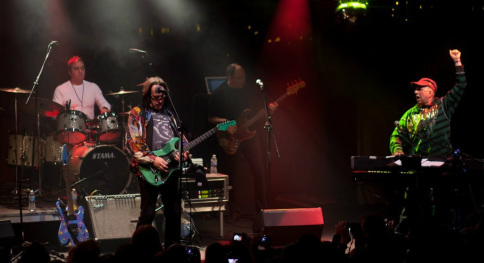 In January 2011 a couple of Todd Rundgren’s Utopia benefit concerts were held to help offset Klingman's medical expenses. The shows featured Rundgren, Ralph Schuckett, Kevin Ellman, John Siegler and Klingman on stage together for the first time since their Utopian 70's. In the summer Klingman also played some shows with the Peaceniks before Todd Rundgren’s Utopia reformed (bolstered by the addition of Kasim Sulton and Jesse Gress) to play a string of dates through November and December. Unfortunately Klingman’s health was such that he could not perform on those dates but it was hoped he would be able to appear at the New York shows. Sadly, that opportunity never arose. I never met Moogy Klingman but over the last few years we exchanged a few emails and had some back-and-forths on social networking sites. Some of his friends and fellow musicians have confirmed he could be difficult at times but he was, more importantly, a genuinely warm, friendly and humorous individual. And a talent that deserved to shine larger and longer. Audio track presented to accompany this article and in tribute to the memory of Moogy Klingman.